Hartford Station of an up goods. 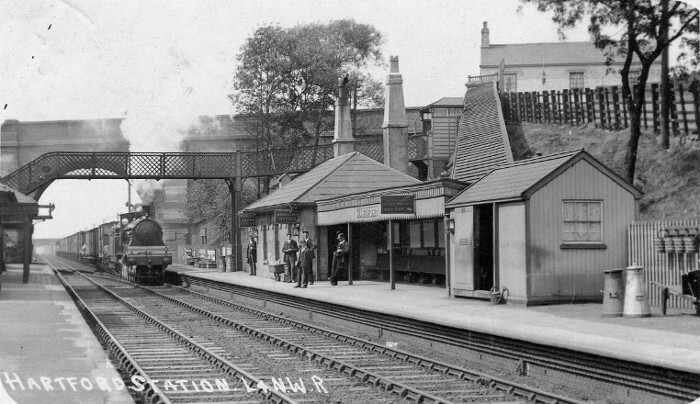 It is from a post card - not an LNWR official issue - and is dated September 1911. The bridge in the background carries the CLC Manchester to Chester mid-Cheshire line. Can anyone add any further information please? My only comment is that the train consists of a high proportion of covered vans, possibly meat vans. The loco (a 'B' Class 0-8-0) appears to be fitted with a vacuum brake pipe. The headlamp code is express freight or cattle train, with less than one-third of the vehicles fitted with continuous brake. (One lamp on left buffer, another at foot of chimney, which is consistent). Peering at a big enlargement suggests that the engine’s two leading wheels are smaller than the others, and the spacing between the front three axles looks bigger than that between the rear three. So I suggest that the engine isn’t a 'B' Class 0-8-0, nor an 'E' Class 2-8-0, but is a 4-6-0 of the '1400' Class - a Bill Bailey. This would explain the presence of the front vacuum brake pipe at this early date. I agree with Harry’s comments and furthermore, if you examine an enlargement, it is possible to just make out the continuous driving wheels splasher which was such a feature of the Bill Baileys. Yes, I agree, a Bill Bailey 4-6-0.